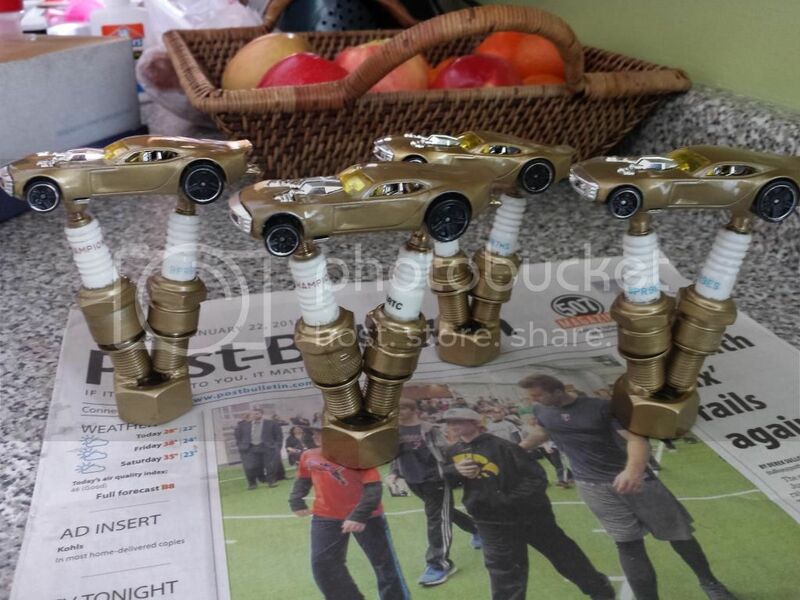 Here are the trophy toppers that I made from spark plugs hotwheels cars and a large nut. I tool apart the car to just paint the body and masked off the white part of the spark plugs. I used Krypton 18k Gold spray paint. I had a few issues when I tried adding a second coat, getting some texturing but most smoothed out while drying. My first test piece got all dull when I started handling it to put the car back together. So I sanded it and repainted then added a clear coat. That seemed to cause a few dark spots to for in the paint when drying. It wasn't too bad so I called it good and finished the rest the same. 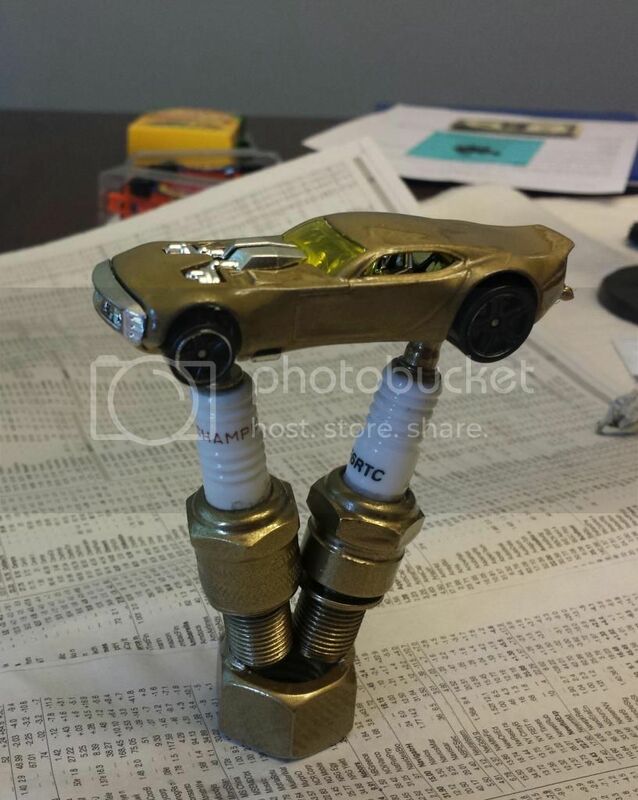 After a few days of curing I took an extra spark plug that I sprayed gold and tried to see what would happen if I applied some Liquid Glass car wax to give it a clear hard layer to protect the the paint. This piece didn't have any clear coat and the LG ended up working pretty darn good at being a paint stripper. So my question to you guys is, do any of you have experience using metallic paint? Any tips for getting a good finish and keeping it from being dulled or rubbed off when handled? Here is the base that I am still getting the rest sanded and epoxied together. They were donated from a counter top shop. The bottom is natural stone and the column is a synthetic with metal foil flakes embedded in it. Last edited by ngyoung on Thu Feb 26, 2015 8:09 pm, edited 2 times in total. Very cool custom trophies ngyoung! The only advice I can think of for the gold spray paints..
Is that you might try some different brands of gold spray paints. Like the Montana gold spray paint. Or a gold paint by Design Master.. sold at michales stores. I feel your Pain. I'm going to guess the paint you are using is an enamel paint and that is what is causing your problem. Think of Enamel paint as "Problems in a can" and never use it on a pinewood derby car. The dark spots you are experiencing is called Mottling. This happens when the paint gets too wet, or doesn't dry fast enough, and the flakes flow together which causes the dark spots. Gold and Silver love to Mottle. Here's how to make your life easier. Go to Walmart and get a can of Rust-Oleum Automobile Primer. Even though it is actually a Primer/Surfacer (a building product) since it is in a rattle can the spray comes out very thin. In your case we will use it as a primer by putting on 2 coats and let it dry. Don't sand it. This will make what you are painting all one color, it will adhere to the base and give the top coat a good base. Go to a store that services Body Shops. Tell them you want a Gold base coat in a rattle can. They'll show you lots of gold colors and pick out the one you like. They'll put it in a rattle can for you. Base coat colors are designed to cover fast, dry fast, and they are not designed to shine. All you want is the color so you don't want to lay it on heavy. This will stop the mottling. When it is dry, maybe 10 to 15 minutes if spraying above 65 degrees, you are ready for the clear coat. Buy air dry clear coat from the store where you get the base coat. This will give you the highest shine. If you are going to use the entire can of clear you might want to get the 2 part clear. It will dry chemically and faster. Once you puncture the can for spraying, the entire can will activate. The two part clear is dangerous to your health so don't have any children around and make sure you protect yourself. The second best system is to primer the parts and then buy Testor's 1 coat covers lacquer paint. I always put on 2 medium coats. Lacquer will mottle but it dries more quickly than enamel and the paint would probably run before it would mottle if you are laying it on that heavy. The paint itself gives an acceptable shine without clear coat for what you are painting. If you insist on clear coat, get the clear from the store that services body shops. Be careful because Testor's also comes in Enamel and you don't want Enamel. I think Testor's can be purchased from Hobby Lobby and Michaels. Those are beautiful trophies. When summer comes I'm going to make some for my scouts. Thank you for the idea. Good Luck with the refinishing. Thanks for the advice. I don't think the gold is enamel since it's dry time is 15 mins and says can be handled in 24 hours. I made the mistake with enamel before with another project. The mottling didn't really happen until I tried spraying with Testers wet look clear coat. I was thinking that I should have sprayed on a primer base for the metal but I got impatient. Now that it already has a clear coat layer I am hoping that will be enough to keep it from rubbing off once they get handed out to the kids. Of $120.00 with single use on the clear, as it has hardener activator release button on can and good for about 24 hrs .I'm listed on their webmail and they offer 30% to 50% off on random products including their chrome in a can. Check out Spraymax for an alternative speed clear too. Its $20 a can. That's what I used. Bike pic shows rear seat cowel painted with ghost chrome over gloss black kylon "cured". 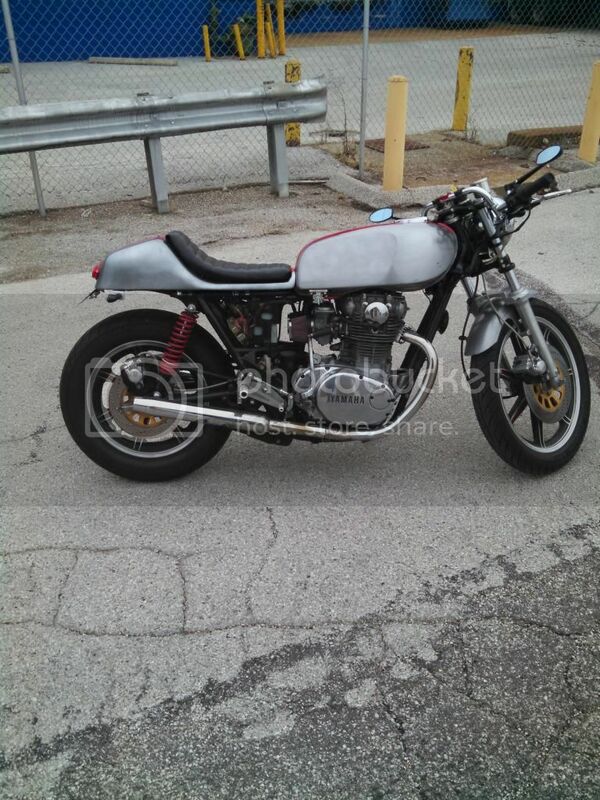 My Gas Tank is krylon enamel clear over bare steel. Of course if you have some spray equipment or airbrush you can buy sample sizes or pints to save some bucks. The brake rotors were painted gold with high temp spray can from advance auto parts. $8.00 I think. Holding up well. But I cooked it in.over metal. Lol. Thanks for sharing that. This all started to try making something unique and for less then the $40ish it would cost for trophies at a store. 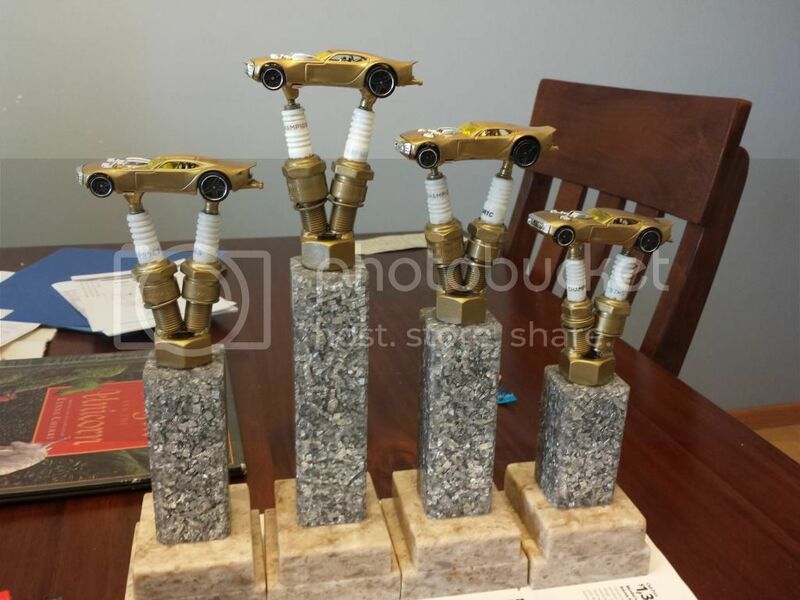 Here is the set of finished trophies. I am just waiting for the plaques to get made to attach them. Doing 1st-3rd and Best in Show.